A group led by UCLA engineering researchers that designs high-performance, customizable computer technologies to improve health care has received a $3 million grant from a public-private partnership between the National Science Foundation and semiconductor giant Intel Corp. The award will help further the long-term efforts of the group, which aims to speed up the computing side of medicine through innovations in what is known as domain-specific computing. Their research has the potential to reduce dangerous radiation exposure during CT scans and lead to the development of patient-specific cancer treatments. Headed by Jason Cong of UCLA's Henry Samueli School of Engineering and Applied Science, the group includes experts in computer science and engineering, electrical engineering, and medicine from UCLA, Rice University, and Oregon Health and Science University. The majority of the team is from the UCLA-based Center for Domain-Specific Computing (CDSC), which in 2009 was awarded a five-year, $10 million grant by the NSF's Directorate for Computer and Information Science and Engineering. The new funding, which extends support for the CDSC for another three years, comes from Intel and the NSF's Innovation Transition (InTrans) program, which was launched in 2013 to address the gulf between government-funded research and industry support for prototypes and products — frequently referred to in research circles as the "valley of death." "The Center for Domain-Specific Computing has already done groundbreaking interdisciplinary work," said Vijay Dhir, dean of UCLA Engineering. "The public-private partnership between Intel and NSF to extend funding for the center promises to lead to new innovations that will help address critical health care challenges." In developing their health care computing innovations, CDSC researchers have focused on domain-specific computing, which has significant advantages over general-purpose computing in medical applications. In domain-specific computing, researchers create custom hardware that can solve a range of related problems within a particular area or domain with high efficiency and flexibility — as opposed to the specialized circuits used to solve only a single problem in cellphones, personal computers and other devices. This customization allows the team to achieve power and efficiency orders of magnitude higher than what can be reached with general-purpose computing, said Cong, director of the CDSC and the UCLA Chancellor's Professor of Computer Science. "We tried to create energy-efficient computers that are more like brains," Cong explained. "We don't really have a centralized CPU in there. If you look at the brain, you have one region responsible for speech, another region for motor control, another region for vision. Those are specialized 'accelerators.' We want to develop a system architecture of that kind, where each accelerator can deliver a hundred to a thousand times better efficiency than the standard processors." With the new InTrans funding, the team will focus on developing accelerator-rich architectures that can be applied to medical imaging and patient-specific cancer treatments. Today, medical imaging is routinely used to diagnose and treat a broad array of medical problems. 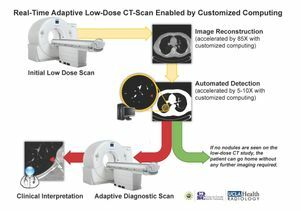 However, diagnostic methods like computed tomography (CT) can expose patients to cumulative radiation that increases their health risks in the long term. Using their customizable, heterogeneous platform, Cong and his team have been able to make one of the leading CT image-reconstruction algorithms nearly a hundred times faster, which could significantly reducing a patient's exposure to radiation. In May, the researchers presented their results at the IEEE International Symposium on Field-Programmable Custom Computing Machines. "The low-dose CT scan allows you to get a similar resolution to the standard CT, but the patient can get several times lower radiation," said Alex Bui, a professor in the radiological sciences department at UCLA and a co-leader of the project. "Anything we can do to lower that exposure will have a significant health impact." In addition to Bui, UCLA co-leaders on the project include Frank Chang, the Wintek Professor of Electrical Engineering and chairman of the electrical engineering eepartment, and associate professors of computer science Eleazar Eskin and Glenn Reinman. "We see the InTrans program as an innovative approach to public-private partnership and a way of enhancing research sustainability," said Farnam Jahanian, head of the NSF's Directorate for Computer and Information Science and Engineering. "We're thrilled that Intel and NSF can partner to continue to support the development of domain-specific hardware and to transition this excellent fundamental research into real applications."